This year marks our 50th anniversary. 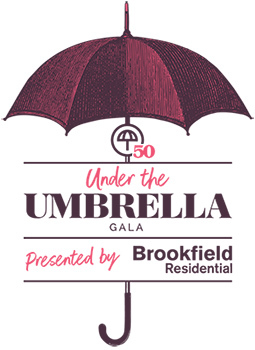 Join us as we celebrate the past and empower the future at the 3rd Annual Under the Umbrella Gala presented by Brookfield Residential at the Renaissance Edmonton Airport Hotel on Saturday, November 3rd. We thank you for joining us in standing together against domestic violence. Our sponsors are incredibly important to us. Your support will strengthen our efforts to deliver programs and services for women and children. To become a sponsor, please contact Linda Kelly at (780)471.6709 Ext 226 or development@winhouse.org. Donation of an auction item is a great way for businesses and individuals to support our event. We can help you design the right donation package that can be something as simple as a gift card or a dinner certificate. Please contact Mary Anne Nguyen by email or phone at (780)471.6709, Ext 225. For more information and inquiries, please contact Mary Anne Nguyen by email or phone at (780)471.6709, Ext 225.